C H A R C O A L.
This shows you the progression and the steps that are taken. 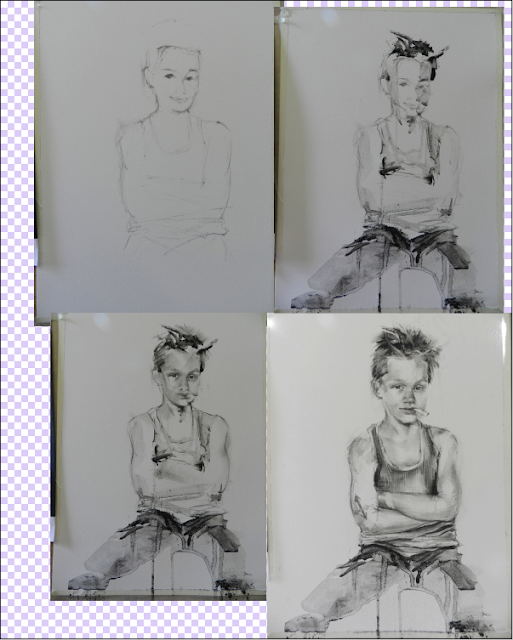 Imagine YOURSELF being drawn in this wonderful process called the Charcoal Wash ! I am a Southern California impressionist artist and work directly with collectors from my studio in Liberty Station, San Diego U.S.A. I had a long career in another creative field: designing Emmy Award winning primetime American television programs in Hollywood. Now ... painting and drawing makes me come alive. A big expansive view of the Pacific Ocean serves as the morning alarm clock from our home where I live with my husband. Member: Oil Painters of America and American Impressionst Society. Copyright © 2018 NANCY TOKOS fine art, All Rights Reserved. Simple theme. Powered by Blogger.